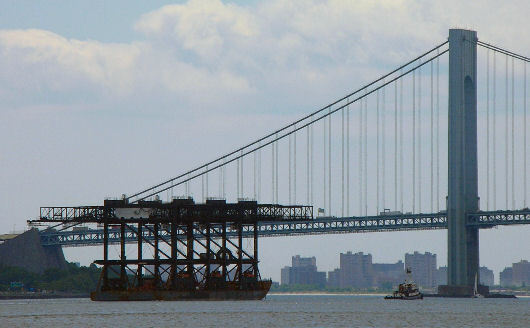 Three low profile container cranes were relocated from Newark, NJ, to Tampa, FL, using the cargo barge ATLANTA BRIDGE. After loading and securing the cranes, the tug East Coast towed the barge to Tampa under favorable weather conditions, with a tow speed averaging in excess of 8.5 knots. The highest waves encountered during the 7 day tow were reportedly no more than 3 ft, well below the design significant wave height of 13.7 ft. Photograph courtesy of East Coast Cranes. Calculate resulting barge motions and resulting inertia loads on the cranes.